Wooden Arbours - Who Has the Best Wooden Arbours? If you’re looking to make your garden more relaxing and attractive, wooden arbours could be just what you need. 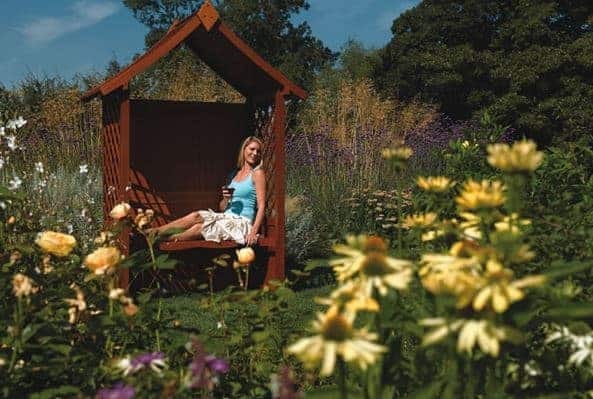 Offering a place where you can sit and enjoy your garden all year round, wooden arbours offer both visual and practical benefits. There’s a wide range available which can make choosing the right one for you a difficult task. Don’t worry if you’re having trouble choosing the best wooden arbours. WhatShed has taken the time to compare all of the different models offered by the top 10 garden buildings retailers so you don’t have to. So why should you trust our top 20 wooden arbours league table? Well, over the years we’ve compared and reviewed a wide range of wooden arbours. Therefore we know what makes one model better than another. Renowned for our comprehensive, informative reviews of the UK’s garden buildings, we will help you make the best purchase to fit your preferences. We’ve also compared wooden arbours from the top 10 retailers which make up over 95% of the online garden buildings industry in the UK. So not only are these great wooden arbours the best off the shelf, they are also very quick and easy to purchase too. With so many attractive, high quality wooden arbours available in the UK, choosing the very best was no easy task. Congratulations to the Hartwood FSC Hathaway Half Arbour for standing out against its competitors. Looking to buy another garden building? WhatShed has the largest selection of independent, in-depth reviews of the UK’s garden buildings. We’ll help you make the best choice to suit your preferences. The modern, elegant looking Hartwood FSC Hathaway Half Arbour is well deserving of first place on the list. 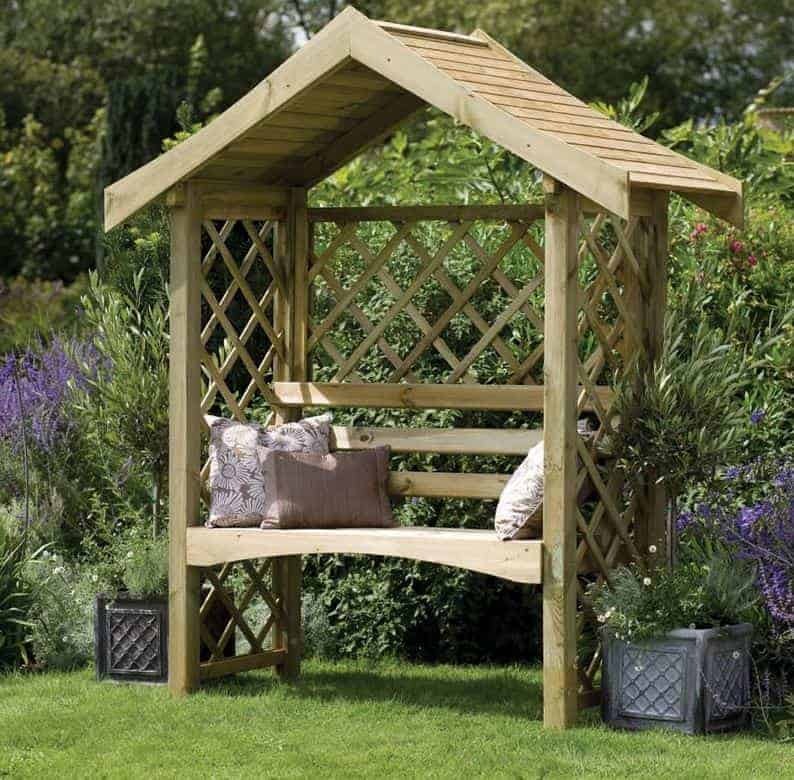 Also known as the Half Burford Arbour, this model comes with plenty of seating and three trellis inserts. What’s unique about this model is that it also comes with a floor. We’ve reviewed a lot of wooden arbours and this is a significant stand out feature. It means you can sit out and enjoy your beautiful garden no matter what the weather, without worrying about getting your feet muddy. However, it also has a more practical benefit too. The rest of the arbour connects to the floor and is properly anchored down, increasing its stability. Want to use the arbour even when it’s raining? With the included apex style roof, you can use this model all year round. It’s design also makes it suitable for installing in a corner, helping to save space if needed. It is also one of the only wooden arbours we came across that is constructed from FSC certified timber. This means it has been constructed responsibly; great news for those worried about the environment. Pressure treated for zero maintenance and supplied with a 15-year anti-rot guarantee, we think you’ll agree this is one impressive arbour. We especially recommend it for those looking to use their arbour to entertain due to its larger than average size. 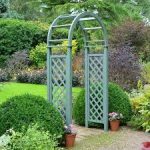 What’s not to love about the Rowlinson Bramble Arbour? One of the most popular rated wooden arbours on the market, it is available from several leading UK garden building retailers. Built from half trellis and half tongue and groove construction, it is one of the most durable, as well as stylish wooden arbours. We especially love its unique rounded roof which we feel gives it a slight chapel design. The half trellis inserts allow you to add climbing plants and flowers to make it look truly beautiful in spring and summer. One of its most striking benefits is its two-tone colouration. Painted a red/brown colour for the main construction and cream on the seat and top part of the roof, it adds a real eye catching, pretty look. The seat itself will fit two-three people comfortably and its overall size means it will fit into any garden with ease. We love the quality, look and great value for money this arbour offers. It’s perfect for those looking for something that will add a decorative element to the garden. The cosy Umbria Arbour is packed full of character and constructed from high quality timber. It is offered in a natural finish, giving you the choice to paint it any colour you wish. However, we love its unpainted design as it adds a beautiful rustic charm that will look fantastic in the garden. The thing that makes this model unique compared to most wooden arbours out there is its fully enclosed walls. Whilst trellis inserts give you the option to add a more decorative appeal, they do require maintenance if you’re adding climbing plants and flowers. The fully enclosed design of this arbour also means you get more weather protection, making it ideal for us all year round. The seating area has a delicate curved design and is built into the enclosure. This adds a very subtle design difference to its competitors, helping it to stand out. It is large enough to seat 3 people and thanks to a great pressure treatment applied by the manufacturer, you will never have to maintain it. Come rain or shine, this is guaranteed to last up to 15 years. When space isn’t on your side, corner wooden arbours are the perfect solution. 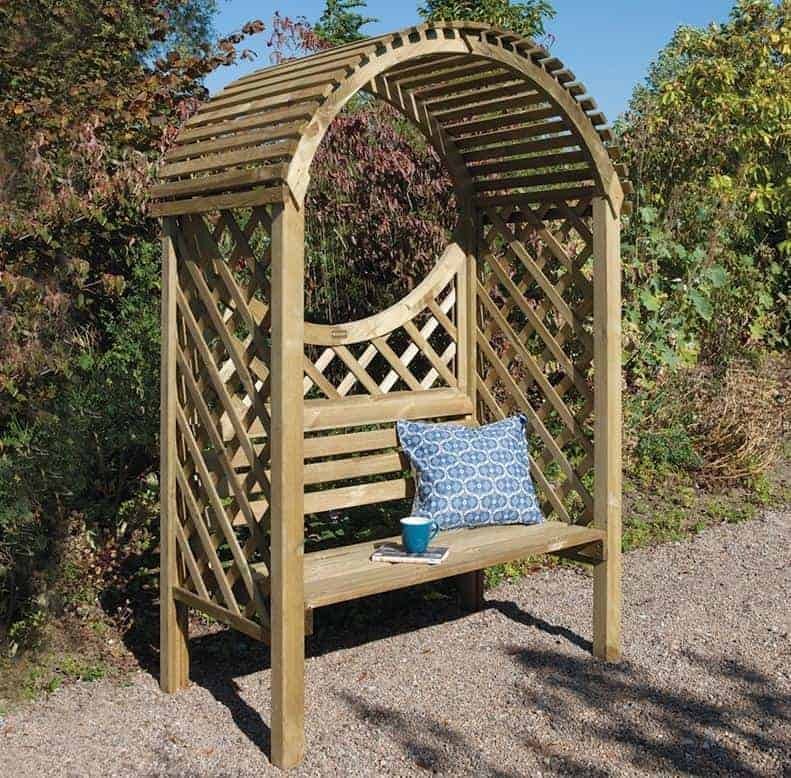 There’s a good choice out there but this Tatton Corner Arbour seat is one of the best quality models we could find. It benefits from a distinguishing look thanks to the unusual Venetian style slatted roof. This design doesn’t just offer a more unique visual appearance however; it also provides plenty of additional lighting whilst protecting you against sun. It has more of a gazebo design, offering a classy, chic look to the garden. Capable of seating up to four people, this is also one of the larger wooden arbours to be featured on the list. It has a very solid design thanks to the 12mm tongue and groove construction. The timber has also been pressure treated so it requires no annual maintenance. This doesn’t just save you time, it also saves you money. This pressure treatment also increases its durability, extending its guarantee to 15 years. 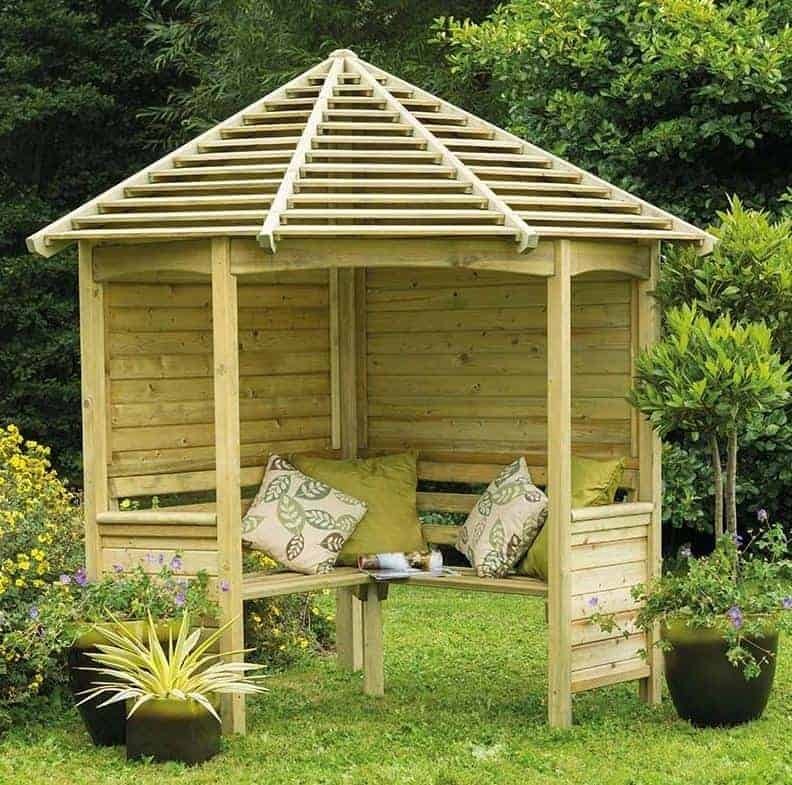 Due to the slatted roof, this arbour is largely designed for use in the summer months. It offers a beautiful shaded area to relax and entertain. The oriental design roof is what first attracted us to this Rowlinson Party & BBQ Arbour. However, once we were drawn in we realised it also boasts some pretty unique features. Take the lift up seat for example. When not in use, the seat can be lifted to provide adequate space for a BBQ. Even the side panels can be lifted to create tables that can be used to store BBQ food and party snacks. So if you’re looking for wooden arbours that can transform into entertainment stations, this is a fantastic choice. Equally impressive is its durability. Now a lot of wooden arbours on the market are pressure treated. So whilst it’s a great feature and means you won’t have to maintain the arbour, it’s not the main reason we chose to add it to the list. However, its fire retardant treatment on the other hand is completely unique. Not many wooden arbours are protected against fire so this could be a leading factor that makes this the right choice for your garden. It makes sense that the manufacturers have made it fire resistant due to the fact that it can be used to host BBQ’s, but it’s still a notable feature to take into account. 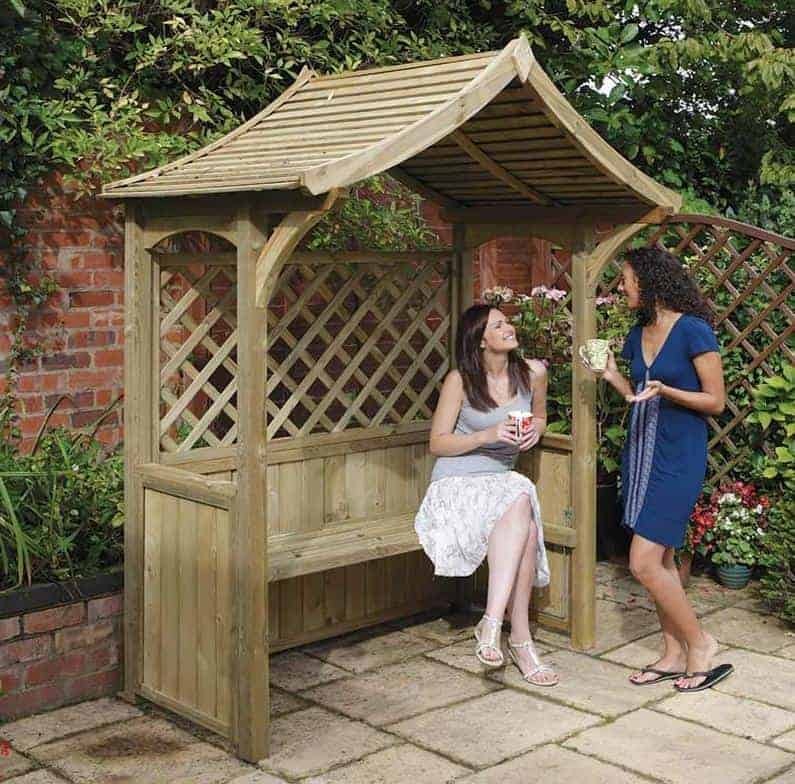 FSC Certified, the Rowlinson Haven Corner Arbour is great for smaller gardens. What makes this arbour so unique is its metal detailing. This doesn’t just add a decorative feature to the arbour, it also adds to its strength, quality and durability. It’s designed to fit into right angle corners and like the Tatton arbour featured earlier, this also comes with a slatted roof. So again this one is recommended for use during the warmer months. You’ll also find this really easy to build. Whilst wooden arbours aren’t overly big, they can still prove tricky to assemble. So the fact that many customers have described this as one of the easiest wooden arbours to build definitely gives it an edge over its competitors. This is another pressure treated model so a 15-year warranty and no maintenance requirements are also included. One important thing to note is that the picture shows a painted version of the arbour. It’s actually supplied in a natural finish. So you will need to paint it yourself if you want to. However, the natural look offers a classy, modern design so painting isn’t really necessary. Wooden arbours come with all kinds of unique features and this Valencia corner model offers something really unusual. As well as an attractive, unique look, the arbour comes with an integrated table as well as comfortable seating. The addition of a table is something you won’t find with over 90% of wooden arbours on the market so it is an exclusive benefit of this model. Why would you need a table? Well, if you’re planning on sitting out with a refreshment or two, it provides a convenient place to keep drinks and snacks. With two seats placed at either side of the table, it’s suitable for 2-4 people. The walls around the arbour consist of trellis panels with a close knit diamond design. It isn’t unusual for wooden arbours to come with trellis features, but no other comes with this amount of trellis available. It means you can decorate the entire arbour with beautiful climbing flowers, making it a spectacular feature in summer. So if you’re looking for something that’s going to be a focal point as well as a nice relaxing spot to sit in, this Valencia arbour is recommended. 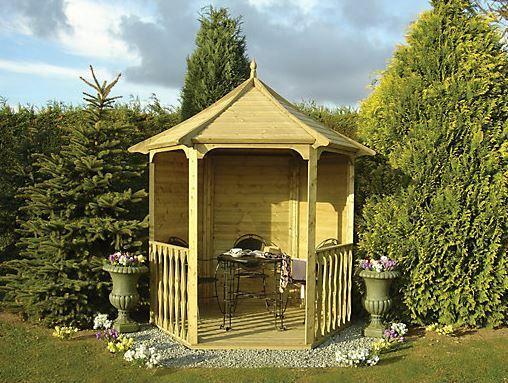 The Canterbury Arbour from Taylors Garden Buildings has an extraordinary luxurious design. Factory stained with a beautiful deep red-brown colour, this arbour is guaranteed to add style and elegance to the garden. FSC certified, you can be sure the materials used to construct this model have been attained from well managed forests. It is one of the more simplistic wooden arbours in the fact it contains a single seated area and a small covered design. It is fully backed with a solid hardwood panel, but the sides feature lattice detailing. This means you can add decorative plants to help turn the arbour into a stunning focal point throughout the summer months. This model is definitely focused more on style and quality. It provides the perfect shaded retreat to enjoy your garden as you sip on light refreshments. The seat is large enough for one person to lay across, or could seat 2-3 people comfortably. It’s achieved high ratings from many happy customers and is one of the most popular wooden arbours available. 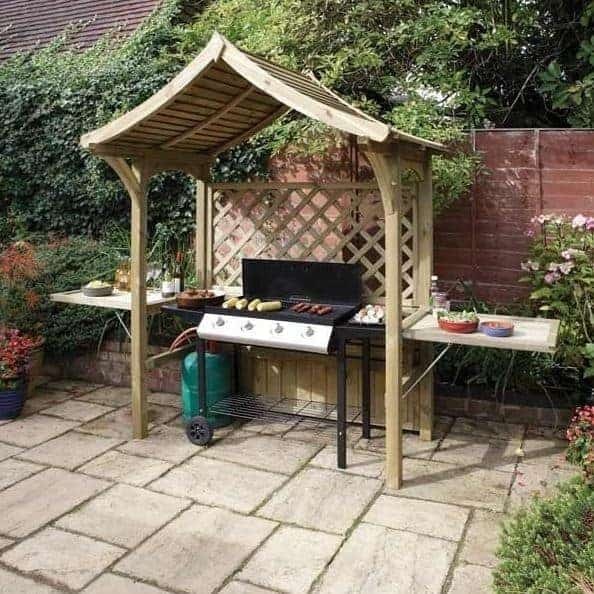 This delightful arbour from Wickes has really surprised us. 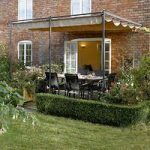 Exclusive to this retailer, the beautiful large arbour boasts a superior quality and striking design. It offers more of a gazebo style and comes with a tough, durable floor. Every part of its timber construction is created with tongue and groove, ensuring a tight, interlocking, strong design. As it is pressure treated, the timber does have a slight green tinge, though this can easily be painted over in a colour of your choice. The pressure treatment means you will never need to apply a treatment to keep it protected against the British weather. This is a definite plus point and great considering its low cost. There are a couple of things we really like about the design of this arbour. The roof in particular is what largely contributes towards its elegant, unique design. It has a carousel style and is larger than the roofs typically found on wooden arbours, ensuring it keeps you dry if the weather takes a turn for the worst. The second design feature we really like is the small fence-like panels on the sides. These help to give it a cosier feel and are a great alternative to the trellis panels typically featured on most wooden arbours. Its size is another advantage, with plenty of space to add your own little table. 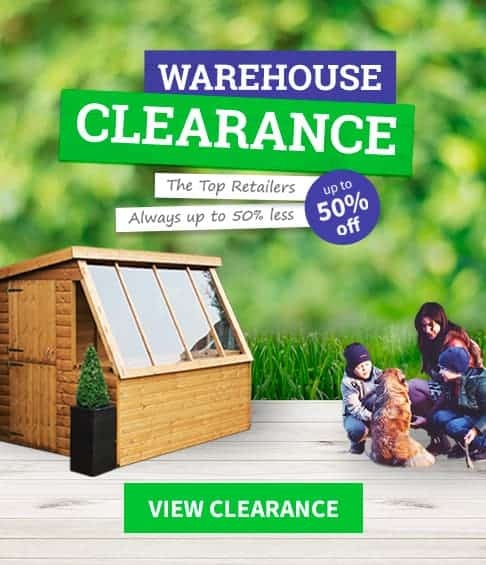 All in all, this is an excellent arbour from Wickes and offers brilliant value for money. 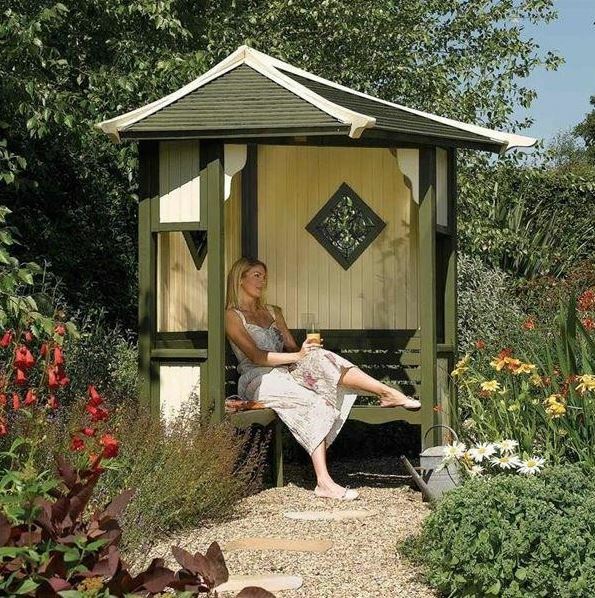 This Solway Wooden Corner Arbour comes with an attractive Oriental style design. Supplied with open slatted panels at the back and sides of the arbour, you have the choice to leave it unadorned for a truly natural, rustic appearance, or to add climbing flowers for a beautiful focal garden feature. With built in seating capable of accommodating up to 3-4 people, this is an ideal option for those looking to entertain friends and family. As well as its stunning oriental look, one of the major reasons we added this to the list is because it comes complete with assembly service. This saves you hours of potential stress and ensures you can use it right away. No other wooden arbours featured on this list come with assembly service included so it’s one of the more unique advantages of choosing this model. 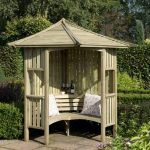 Constructed from top quality softwood, the arbour is pressure treated so it never needs to be maintained. We also think you’ll appreciate the built in shelf behind the seating area which allows you to store refreshments and perhaps a bottle of wine and as you sit and relax after a hard day. Guaranteed to last 10 years, you’re getting very good value for money when you invest in this model. The Sunflower Arbour set is a corner arbour with a difference. Featuring a more L-shaped design, this arbour is fully open, giving it a light and airy feel. It can comfortably accommodate up to four people and it’s seating area is larger than most, offering an elegant, comfortable design. Another unique benefit of the seating on this arbour is that it comes with a sloping back. This enhances its comfort, allowing you to lay back and relax in the warm months. 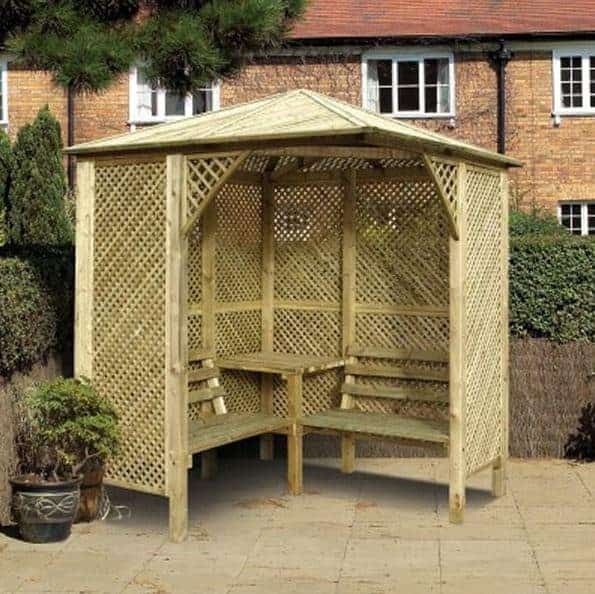 There are four trellis panels included which makes this a particularly good arbour to opt for if you’re looking to add floral decorations. The trellis panels are also wider than average, making it possible to grow larger climbing flowers. To ensure maximum durability, the timber has been pressure treated, contributing to its outstanding 15-year guarantee. 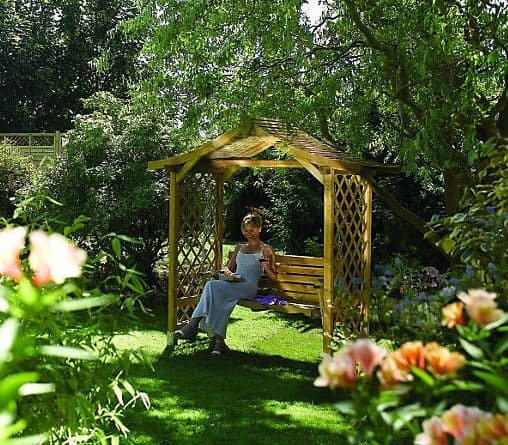 If you’re looking for a large, comfortable and eye-catching arbour that you can turn into a decorative focal point in the garden, this one is a brilliant option. Imagine sitting back in your garden on a hot summers day, gently swinging with your eyes closed as the sun hits your face. Well, with the Rowlinson Dartmouth Swing Arbour you can do exactly that. Rowlinson offers the largest choice of high quality wooden arbours available in the UK. This is the only model that comes with a swinging feature however. It has a wider than average construction, making the seat comfortable for two people. 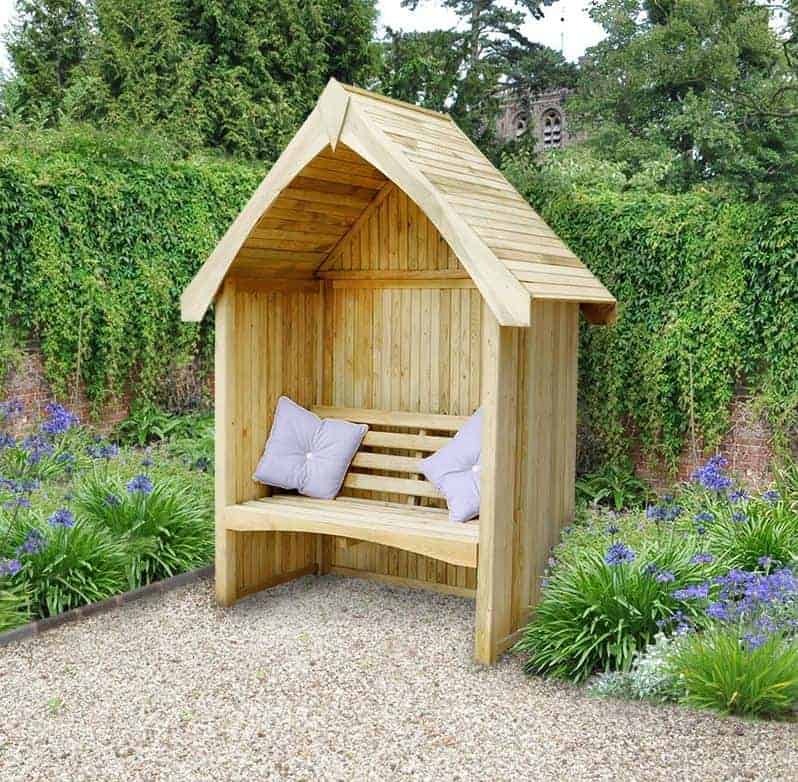 Not only is this one of the more elegant wooden arbours on offer, it’s also one of the most romantic making it the perfect choice for couples. A wide apex style roof provides fantastic shade in the summer, whilst two trellis panels allow you to add climbing flowers for a beautiful decorative element. There is no back to this arbour which is another unique detail, but the swing has a back so you won’t have to worry about falling behind. As this arbour has a swing feature, it needs to be secured to a solid base. The good news is it comes supplied with galvanised steel base fittings. Along with the pressure treated timber, these are guaranteed to last for a minimum of 15 years. One of the lesser known brands of wooden arbours, this brilliant Forest Cadiz offers a chic, solid design. Supplied with a natural finish, you could easily paint it any colour to fit your preferences. It provides a wonderfully simplistic shaded seating area that’s perfect for use in summer. A solid back and roof provide shade, whilst the large open trellis side panels enable you to grow bright, beautiful climbing flowers. The seating area has a great curved design, enhancing its comfort and visual appeal. It benefits from a more compact design, making it great for the smaller garden. We’ve chosen this model not just for its great quality construction, but because it’s proven to be one of the most popular wooden arbours available. It’s received many great reviews, with customers reporting it offers excellent value for money. Pressure treated, it also benefits from a 15-year guarantee for complete reassurance. Are you ready to party? With this great Rowlinson Party Arbour you soon will be! It’s a larger model than the one featured higher on the list, making it great for larger gatherings. If you frequently entertain large groups in the summer months, this is exactly what you need. It’s large covered roof makes it ideal for hosting BBQ’s, while folding tables give you plenty of space to store food and refreshments. When you’ve finished with the BBQ you can pull down the seat and lay back in comfort. There is a trellis insert at the back of the arbour so you can also add your own floral adornments to create a truly beautiful focal point. Though it is supplied in a natural finish, you can easily paint or stain it in any colour you want. It’s not only pressure treated for excellent longevity, it also comes with a fire retardant design. This gives you total peace of mind if using it as a BBQ area. We’re really impressed with this large, wooden arbour. It’s 2-in-1 design is a unique benefit and considering its excellent features, it’s offered at a very competitive price. 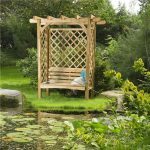 Being one of the most popular wooden arbours on the market, this great Rowlinson Jaipur Arbour is available from many leading retailers. It comes with a spectacular almost Indian style design, making it really stand out from competitor models. A curved slatted roof allows plenty of natural light through, whilst still offering plenty of shade against harsh sunlight. It benefits from incredibly easy assembly, which is something not all wooden arbours offer. Supplied in an unpainted, pressure treated finish, you can leave it as it is or choose to paint it any colour. Backed by an awesome 10-year warranty, you can rest assured this is going to last many years in all weathers. It comes with a comfortable seat for a maximum of two people and comes with a trellis back and sides. This means it’s perfect for those wanting to add floral detailing to make it more attractive throughout the spring and summer months. 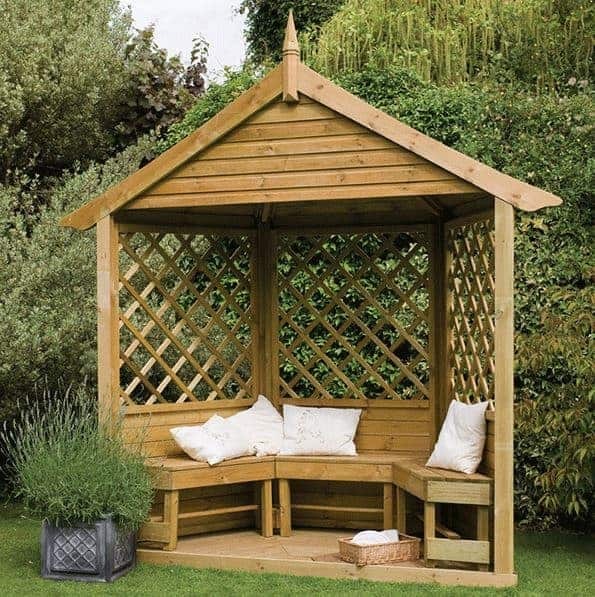 Sold at a very low cost, this impressive little arbour is ideal for any budget. The second swing wooden arbour to be featured on the list, this Store More Poseidon model offers one of the most solid designs of any arbour on the market. Its extra-thick wooden construction is long life pressure treated and it comes with a 7-year warranty. Unlike the other model featured on our top 20 wooden arbours list, the swing seat on this one is hung by a chain. It also features a slatted apex roof which provides great protection against the sun’s rays, whilst also adding a lighter, airier feel to the arbour. Half trellis inserts at the sides look great unadorned or beautiful if decorated with colourful flowers. For safety purposes the arbour also comes with extra strong posts that are securely fixed to the ground via metal bolts. This makes it a very good option for family homes. It won’t matter how hard your children try to swing on the arbour, it won’t fall over. It’s a great value model that really does look fantastic and it comes highly recommended by the WhatShed team. 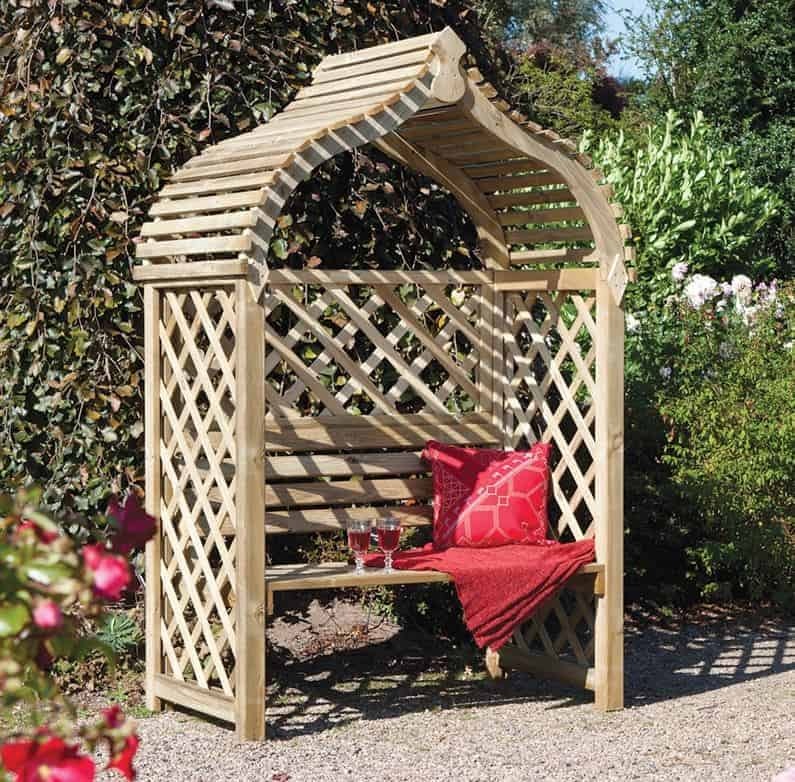 The really attractive Arbour-Plus Portofino Arbour provides a very elegant look that will fit in with any style garden. Constructed from slow grown softwood, its pressure treatment offers a long-life design, guaranteed for 15 years. 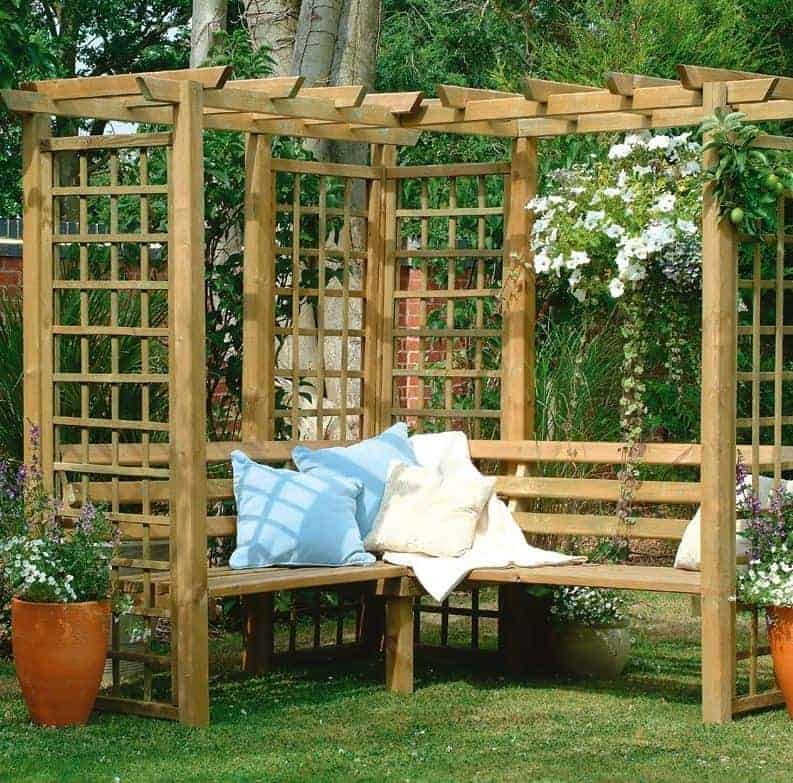 To give the arbour a light and airy feel, the back and sides are created with trellis panels. Even if you choose not to add floral decorations to the trellis, you’re still benefitting from a very attractive arbour. It’s considered to be one of the best buys from top retailer Shed Store. It’s difficult for wooden arbours to stand out from the crowd but the manufacturer has managed it by creating a unique, wide gap bench. The back of the seating has wider than average gaps which really add a unique style, whilst still remaining comfortable to lean back against. The most notable feature we know you’ll love, is the sides are constructed to be slightly longer so that they can be stuck down into the ground. 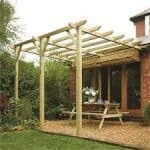 This creates a very stable arbour that won’t move even in the strongest winds. Its clever design is what made us rank this as one of the top 20 wooden arbours on offer. 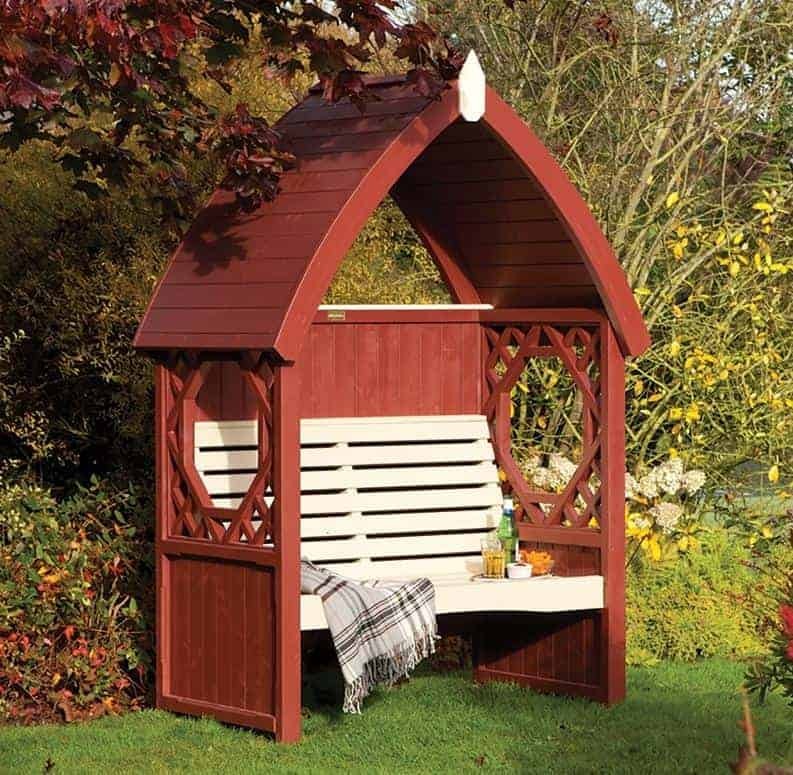 The budget-friendly, rounded Rowlinson Keswick Arbour comes with a curved back panel and an open slatted roof as part of its unique design. 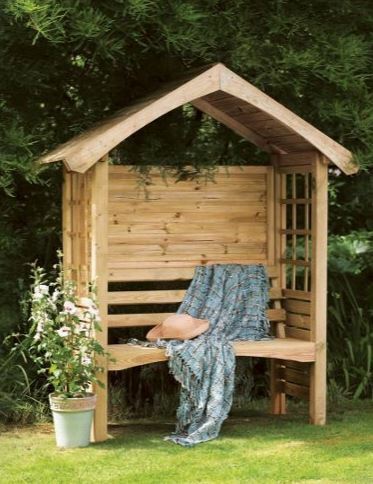 A natural FSC softwood construction gives the arbour a very traditional, rustic design. However, like other wooden arbours on the list, it could also be easily painted to fit your preferences. 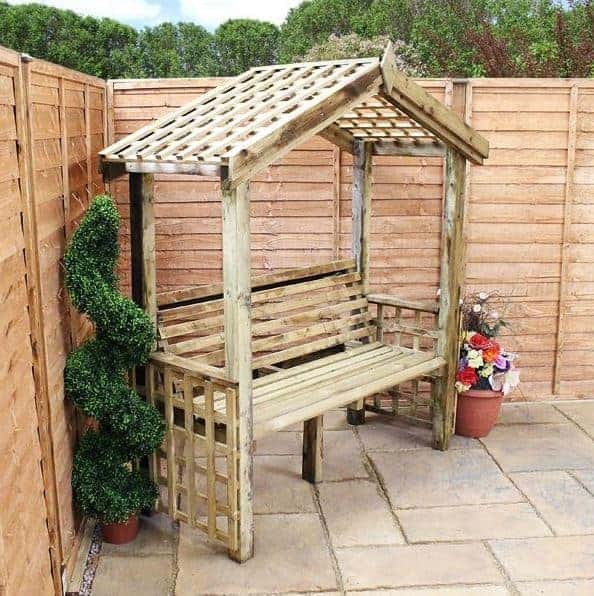 A built in bench offers the perfect place to sit out on warm, sunny days, whilst the trellis sides and slatted roof help to shade you from the sun. One thing we like about this model is that it comes with comprehensive instructions. This makes putting it together quick and simple. It’s no surprise to us this is one of the more popular wooden arbours out there. Offering a great value low cost and a sensational 10-year manufacturer’s warranty, your money really does go far with this model. We’re seriously impressed with this remarkable Shire Forget Me Not Arbour. It’s not just the quaint design that we really like; it’s also constructed from Shiplap cladding. This is most typically found on garden sheds and is the highest quality construction you can invest in. No other arbour on this list comes with Shiplap construction so it’s low cost makes it even more outstanding. It is supplied in a natural finish which isn’t shown in the picture. However, its smooth Shiplap build makes it easier than ever to paint over. You won’t need to worry about treating it as it comes with a long lasting pressure treatment already applied. A sharp apex roof provides excellent protection against even the heaviest downpours, ensuring water doesn’t collect on top of the roof. The solid bench can seat up to two people and its compact size makes it a must for any garden. If you’re looking for quality that doesn’t cost the earth, you won’t find a better arbour than this one. 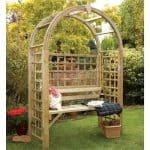 Last but certainly not least, the Waltons Trellis Arbour Seat is the best budget-buy on the list. It’s also the only arbour on the list that comes with a trellis roof as well as trellis bottom side panels. It would look particularly striking with ivy or honeysuckle, helping you to create a beautiful garden feature. Like the others, this is pressure treated so not only are you getting it for a super-low price, but you’re also investing in an arbour that’s going to last. Being one of the smaller models on the list, it is suitable for practically any garden. 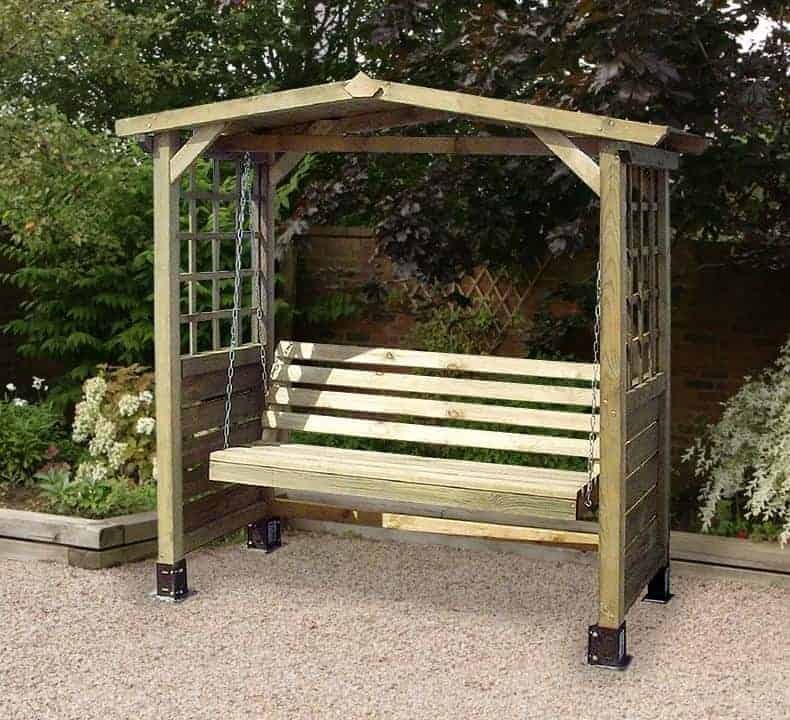 Its solid bench is capable of fitting two people comfortably and if you do decide to add ivy or another climbing plant to the roof, you’re going to benefit from a shaded spot to enjoy your garden on hot summer days. It’s a fairly basic model but it still offers a great stylish look and it more than competes with higher priced competitor wooden arbours.